APRJC CET 2019 : APRJC Admission Test 2019, How to Apply Online at aprjdc.apcfss.in APRJC CET 2019 Notification, Online Application,Exam dates, Eligibility Criteria Andhra Pradesh Residential Junior Colleges Common Entrance Test which also known as APRJC 2019 notification and examination details has been announced by Andhra Pradesh Residential Educational Institution Society (APREIS), Hyderabad on behalf of Government of AP for admission to Intermediate courses like MPC/BI.P.C/MEC/CEC in Residential Junior Colleges in AP State for the academic year 2019-2020. Applications are invited from candidates who intend to take admissions into Inter First year in AP Residential Junior Colleges for the academic year 2019-2020. APREIS invites online applications from the eligible candidates for admission into Intermediate first year courses in its APR Junior Colleges for the academic year 2019-2020. Andhra pradhesh state government provides high class education to who are unable to study in leading private institutions . In this colleges, they are providing EAMCET Coaching and other competitive exams as well. Eligible and interested candidates may submit their applications through online only at official website .To know more details regarding APRJC 2019 Notification, Eligibility, Exam date, How to Apply, Online Application form, Exam pattern, Important dates, Fee Details, Last date for Apply online, Test centers, Answer key , Hall ticket, Results and other details given here. 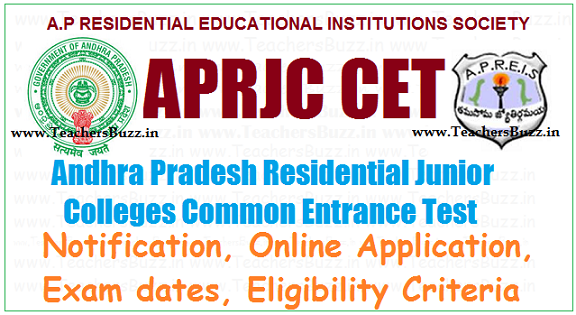 Andhra Pradesh Residential Educational Institutions Society (APREIS) has published a notification for Andhra Pradesh Residential Junior Colleges Common Entrance Test (APRJC CET) in the month of March 2019 to select eligible students to pursue inter in their ten APRJC institutions present in the State of Andhra Pradesh to join inter academic session 2019 -2020.
b) Must have passed the qualifying examination in first attempt in March/April 2019 only. 2. The candidate after satisfying himself/herself about the eligibility criteria for the submission of application through online shall pay a fee of Rs.250.00 through APONLINE or mee-Seva from 14.03.2019 to 14.04.2019 for submission of application through Online. 5. On submission of Application ONLINE, the candidate has to take a copy(print) of application form in which a reference number also be given. This Reference number is required to download the Hall Ticket. The copy of online application is to be preserved for further reference. 6. For any mistakes/incorrect information, the candidate is solely held responsible. Hence, they must take utmost care while filling the online application. Candidates can download their Hall Tickets from the website at aprs.cgg.gov.in or www.apresidential.gov.in with the reference number allotted to them. 2. Option of the College exercised in the application. ADMISSION: Admission will be made through counselling. First counselling for admission will be placed at https://aprjdc.apcfss.in/ . The candidate after satisfying himself/herself about the eligibility criteria for the submission of application through online shall pay a fee of Rs.150.00 through online from 14.03.2019 to 14.04.2019 forsubmission of applicationthrough Online. ఆంధ్ర‌ప్ర‌దేశ్ రెసిడెన్షియ‌ల్ జూనియ‌ర్ క‌ళాశాల‌లు, డిగ్రీ క‌ళాశాలల ఉమ్మ‌డి ప్ర‌వేశ ప‌రీక్ష ప్ర‌క‌ట‌న విడుద‌లైంది. ఈ ప‌రీక్ష ద్వారా రాష్ట్రంలోని వివిధ జూనియ‌ర్ క‌ళాశాల‌లు, డిగ్రీ క‌ళాశాల‌ల్లో 2019-2020 విద్యా సంవ‌త్స‌రానికిగానూ ప్ర‌వేశాల‌కు ఇంటర్మీడియ‌ట్‌, డిగ్రీ మొద‌టి ఏడాదిలో ప్ర‌వేశాలు క‌ల్పించ‌నున్నారు. Candidates can download their Hall Tickets from the website at http://aprjdc.apcfss.in or www.apresidential.gov.in with the reference number allotted to them.